It was a doable day trip to the Thomas Edison Center at Menlo Park, and the photos of the light bulb intrigued me. A monumental replica of Edison’s first practical incandescent bulb, it’s nearly 14 feet of Pyrex glass segments. 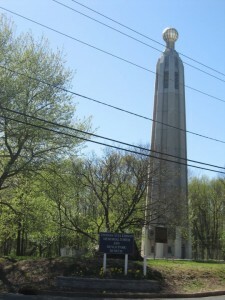 It sits on top of the 117-foot concrete Memorial Tower, which was built in 1937 by Edison’s employees. It’s an homage to both the light bulb and another key Edison invention, the phonograph. Any grade schooler can attribute the invention of the light bulb to Edison, but did you know he also invented the phonograph, motion picture camera, dictaphone, mimeograph, storage battery and much, much more? I guess I missed that day of school. Visiting the adjoining museum set me straight. 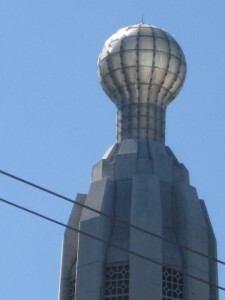 Less than 15 miles away, the world’s tallest water sphere in Union was an add-on to the light bulb visit. Since it sits on private property, you can’t get that close. After getting a lot of good information on the website dedicated entirely to this tower, I decided to get a look at it from Ingersoll Terrace, a street nearby. It looks pretty big, as water towers go. Yet in comparison to others we’ve seen, it’s hard to distinguish it by its height. The distance from which we saw it probably affected our perspective. Here’s a nifty Edison connection between the two sites: On Ingersoll Terrace, where we viewed the tower, sit four concrete houses which Edison designed and were built in 1910. Toward the end of his professional life, he owned a concrete company. They’re distinctive among the others on the block, both for their architecture and colors. Edison’s laboratory was located on this tract of land from 1879-1884, before he moved to a more well-known site in West Orange, NJ. Still in his 20’s and relatively unknown during his time here, Edison was already churning out patents at the unbelievable pace of a sheer genius. Besides the phonograph and the light bulb, he came up with 400 other patents. Our closest attempt at invention was a device, of questionable safety, designed to keep The Boy’s pacifier in his mouth while he was sleeping (devised in the wee hours of the night). The small staff of museum guides couldn’t be nicer, or more willing to provide one-on-one tours. Our guide walked around with us, gave us information, and patiently answered The Boy’s questions. Q:“Would you call Edison the father of the iPod?” A: “More like the grandfather.” Then he pointed out the similarities between how recordings were etched into the phonograph cylinder, in comparison to how recordings are burned onto a CD. Instant hero status. Even better, he then played several of the antique phonographs just for us. The Boy’s jaw dropped, and The Girl even stood still long enough to listen to the scratchy melody. Getting that little first-hand taste of history was well worth the trip. Have yourself a 40-second listen! The tower was meant to commemorate Edison’s light bulb and his phonograph. The bulb is still lit at night, and music used to play from decorative speakers at its base. Hopefully, by this time next year, it will again. It’s reassuring to know that a restoration project will soon be underway, because the Art Deco tower is showing its age, and the 1947 museum is in a small, outdated two-room building. However, back in “the day,” Edison oversaw a complex which included the main laboratory building, the glass house, a carpenters’ shop, a carbon shed, and a blacksmith shop. The laboratory was the world’s first such research and development facility. Interesting factoid: Edison’s laboratory was a two-story wood construction. It sits on a high point of what was mainly flat farmland. At the time, the view was the top floor porch was so expansive, they supposedly could watch the construction of the Brooklyn Bridge. The water sphere was built in 1964 to hold water and provide Union, NJ with reliable water pressure. The main tower is 212 feet tall and holds 250,000 gallons of liquid. It is owned and maintained by the American Water Company. Water spheres use height and gravity to create water pressure for a water distribution system. A spherical shape is simple to design, construct, and helps resist asymmetrical pressures like wind, rain, or gravity. After seeing the water sphere, we navigated the short distance to IKEA. Had we not used the GPS, I’m certain we would still be roaming the roads of Union. The crazy layout of highways and roadways in NJ is fodder for many a traveler’s rant, so I won’t belabor it. Suffice it to say; jug handles? Why?!? We got the “big girl” bed, enjoyed the requisite meal of Swedish meatballs, and headed home, straight into a blinding sunset. A 6 for most. A 7 if you have school-aged children in need of a hands-on history or science lesson. A 3, only because there’s not much more to the experience than viewing it from afar. The regular museum hours are: Thursdays – Saturdays 10:00 AM – 4:00 PM. There is no charge to visit the Tower or museum, but donations are appreciated. 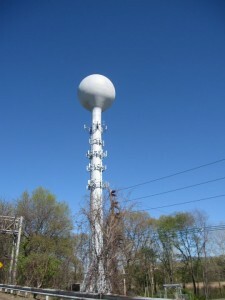 The water sphere is located in Union near the intersection of the Garden State Parkway and Morris Avenue. Route 22, Interstate 78, and other roads also pass within viewing distance. p.s. 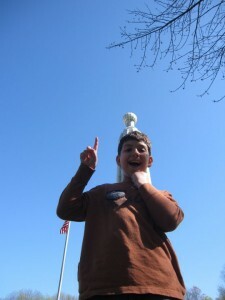 I was totally sucked in by the water sphere’s blog site, mainly because of the loving dedication shown by its administrator. I was caught off-guard by the intriguing breadth of content he’s been able to incorporate into a site about what is essentially a public utility!